I’ve been slowly getting things together to redesign and update my website. 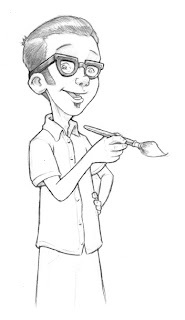 This is the line drawing for a little self portrait for the bio section on my site. It is always kind of weird for me to draw myself. I really don’t know how much it actually looks like me, but it works. I’ll post the colored version as soon as I have a chance to paint it.